Do you Really know how to make the most of it? Do you dread music receptions, banquets, and other music, recording and business-related social events? Does attending another Show Case or Record Launch make you want to run inside your bedroom and lock the door? You’re not alone. Many of us are apprehensive about these music business situations, because most of us either hate entering rooms where we don’t know anyone or hate spending time with music people we don’t know well. Keeping a conversation going during such occasions is an ordeal. Everyone learns the technical skills required for music, recording, publishing, but not everyone places importance on conversational skills. The ability to talk easily with anyone is a learned skill, not a personality trait. Acquiring it will help you develop rapport with other music people and leave a positive impression that lasts longer than an exchange of business cards or Email addresses. Dec Says: By far the best place to learn talking skills is at 'Toastmasters International' - a world wide circle of folk interested in talking, whether making speeches or simple presentations ... or just being able to hold a conversation. I advise everyone who will listen to join your local Toastmasters Chapter .... check out your nearest at http://www.toastmasters.org/.. It is non profit making, they meet every second Wednesday 7pm to 9pm ... you will meet astonishing people and become a speaking force to reckon with. Dec Says: In Toastmasters or your local Chamber of Commerce they teach you that the first 30 secs. is the most important when you are introduced to someone. Work out a good 30 secs. that brings over who you are, what you do in the music business, and the fact that you are a nice guy to talk with. You should work hard on this 30 sec. presentation and hone it to perfection. Introduce yourself. 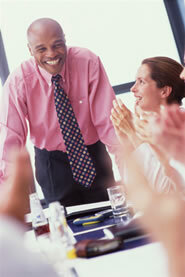 Act as if you’re the host and introduce new arrivals to your conversational partner or partners. Dec Says: I have seen guys totally take over functions and gatherings using this technique .. so that the punters think he is someone to reckon with ... it's simple ....just do it. You can look like you are in charge of the whole music function. Smile first and always shake hands when you meet anyone. Dec Says: The smile is the most important bit. so long as you have teeth to die for....well have you? A firm quality hand shake impresses...but never shake a hand too hard, just enough ... especially with the ladies ... and don't forget, in today's 'lovey' world it is expected of a confident man that he kisses a lady on both cheeks ... that is the real world of ' Show Business'. Take your time during introductions! Make an extra effort to remember names, and use them frequently in the conversation. Dec Says: The best trick for remembering names is to repeat it three times immediately you are introduced ...... "Dec this is David Stelling" ..... "David Stelling, what a great name, David have you met these nice folk I am talking with...... David, let me introduce you....etc." Works every time, and you will be surprised how you remember the name even when you meet three weeks later at another music or recording function. Maintain eye contact in any conversation. Many people in a group of three or more people look around in the hope that others will maintain eye contact on our behalf. But people don’t feel listened to if you’re not looking at them. Dec Says: Toastmasters International really teach you how to maintain eye contact ... so important. Don't you just hate it when you are talking with someone and they are constantly scanning over your shoulders to see someone of more importance in the music business? Get somebody to talk about why they’re attending the event, and you are on your way to engaging them in conversation. Dec Says: There are some people, in the music industry, of whom it can be said: "if the letter 'I' was missing off their computer they couldn't write a letter". In other words, they simply have no conversation other than talking about themselves. Concentrate on using the words 'you'. 'we', 'they', 'us'. Even if you cannot avoid saying 'I', there is always a way of turning the phrase around to mean the same thing but doesn't use the word 'I'. Try it ... next Email you write, simply do not use the word 'I'. Go back over this article and check how few times I use 'I'. There, I have given you an excellent secret of writing well and gaining respect in the music / recording / publishing / production business. Listen carefully for information that can keep the conversation going. Remember, football is a spectator sport and most people at a music / recording function are 'doers' and 'participators' not spectators. I wouldn't know one end of a football pitch from the other...and strangely, due to the circles I mix in, I know loads of ultra famous footballers...and they love it that I don't bore them with talk of football. Remember: People want to be with people who make them feel special, not people who are “special”. Take responsibility to help people you talk to feel as if they’re the only person in the room. Dec Says: So important, this point. Everyone, especially in the music and recording game, loves to be flattered... "nice tie Charles, I've always wanted a silk tie that colour...where did you get it?" Play the conversation game. When someone asks, “How’s business?” and “What’s going on?” Answer with more than “Pretty good” or “Not much”. Tell more about yourself so that others can learn more about you. Dec Says: It is important to steer the conversation back to them.... if they ask you an 'open ended question', as above, be sure to finish what you say with a similar open ended question ... "and tell me how did you get to be CEO of Sony International" ... that should keep him going for an hour? Be aware of body language. Nervous or ill-at-ease people make others uncomfortable. Act confident and comfortable, even when you’re not. Dec Says: A mighty trick is to always be aware of the way you are standing, or sitting...ask yourself the question: "if I was pictured now by a 'Hello' magazine photographer would I look stunning and glamorous?" In other words, always 'make pictures' ... in the music industry, this is as important on stage as off stage. Showing the 'art' ... Kevin Woodford [Ready, Steady, Cook] and Dec .... making pictures ... you never know when the camera will click. This time on Kevin's top rated radio show. Would your picture appear in the 'dreadful, off guard picture' section of the celeb magazine or the totally glamorous section? Be prepared. Spend a few minutes before an anticipated event preparing to talk easily about three topics. They will come in handy when you find yourself in the middle of an awkward moment... or while seated at a table of eight where everyone is playing with their food. Dec Says: Yep, just the same as doing a radio or TV interview for your new recording release, have three fantastic, funny stories ready...each of different length. Always use the short one first. Real, true stories involving yourself, even if they are stolen from a joke book or funny story in a newspaper or News programme. Just putting yourself in the lead part of the story will make you the most skilled conversationalist around. Toastmasters International rate this skill so highly that they devote a whole instructional book to it. Show an interest in your conversational partner’s opinion, too. You’re not the only person who has opinions about funding the space program or what will happen to the stock market. Dec Says: Nothing is more annoying than ranting on about your opinions...leave them at home. No one wants to hear that Jimmi Hendrix would leave Brian May standing...that is simply your opinion ... the guy you are talking to may have every Queen album ever released and a whole wall devoted to Brian May pictures. He could also be the boss of a very major label that you would love to have a recording deal with. Be prepared with exit lines. You need to move around and meet others. Don’t melt from conversations. Make a positive impression by shaking hands and saying goodbye as you leave. Dec Says: Yep, this reinforces the perception that you are the most important person there. You have to get around to everyone. Make sure of the huge goodbye and if you see a photographer make sure to grab his attention and take a photo of your group. Nothing impresses more and you never know where that Show Biz photo will turn up....'Hello' magazine? In fact have a photo taken with each group you talk with .... eventually the buzz will go around ... "who is that guy in the Versace suit with the fantastic tan ... must be someone really big in the business?" Get the photo taken - It's all called: "Being famous before you are famous"
But all guys in The Serious Writers Guild know about this most important skill....you want to learn it? With practice, you can learn how to make the most of meetings with Record and Publishing Companies, interviews, and networking events or of entertaining clients at Music Showcases, conventions, trade shows, and other music-related functions. You’ll learn to appreciate, rather than dread, music networking events. The idea for this article was by Debra Fine. Thank you Debra. She is a former engineer living in Denver who works nationwide as a speaker and trainer presenting “The Fine Art of Small Talk”. She is the author of The Fine Art of Small Talk (Hyperion October 2005). Visit www.DebraFine.com or call 303-721-8266 for additional information.